I don’t know about you guys, but here at Casa del Mel spring has really started to take hold. Although I still have tons of snow in the front yard, the sun-drenched backyard is almost snow free. That means we have mud in abundance. Fortunately, the worst of the mud appears only as mud prints in my house. Neither Daisy or Maggie like to roll in. Thank goodness! It appears Harley, the Labrador retriever, is quite the opposite. I can hardly imagine the horror of having to clean a dog after this. God bless his owner! Hope you have a lovely Friday and Easter weekend! How do I know? The birds are singing, the sun is staying up later at night, the tulips are starting to pop up from the ground… and mud puppy season has begun! 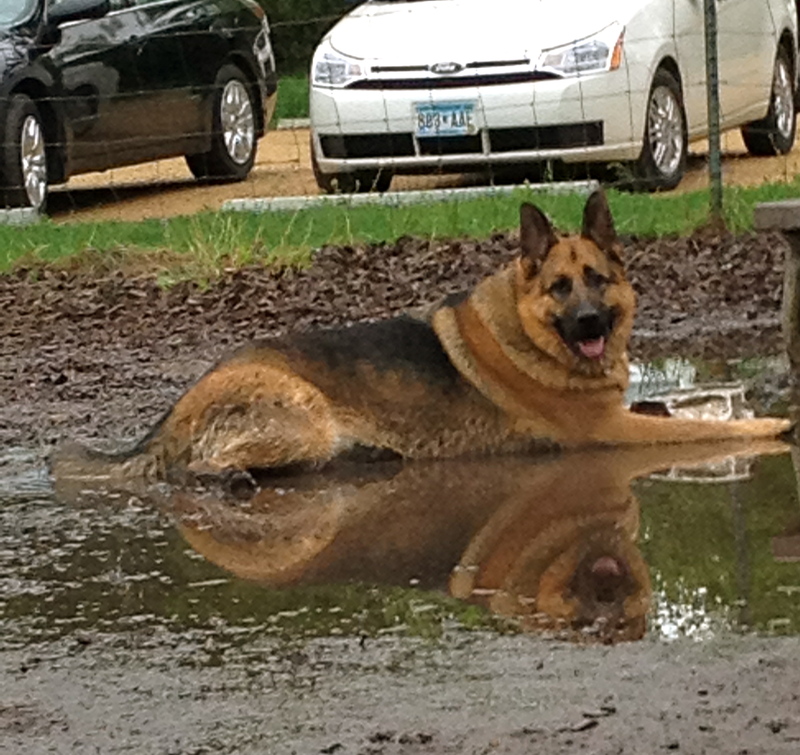 Minnesota has had several rainy days in a row now and the yard (and the dog park) is a muddy mess. Keeping the dogs and the house clean is going to be a challenge. But the mud we’re dealing with is NOTHING compared to the mud these dogs are playing in. Have your own muddy puppy? Feel free to share on our Facebook page! At least you can laugh… right? This last one should really have been set to music. Can you imagine? It’s been lovely in Minnesota the last few days. We’ve had a series of 35 degree days and the snow is finally starting to melt. It has me thinking that spring is finally on its way. Soon the crocuses and tulips will be pushing up from the ground, and the birds will be singing their love songs to one another. I’ll be able to throw open the windows and breathe in the fresh spring air, and the dogs and I can spend more time outside. Of course, there is one thing that comes with a spring thaw… MUD. Lots of it. And, who loves mud? Dogs. They love running through it and rolling in it and, worst of all, wallowing in it. Jasper! Get out of that mud! It’s Black and White Sunday. 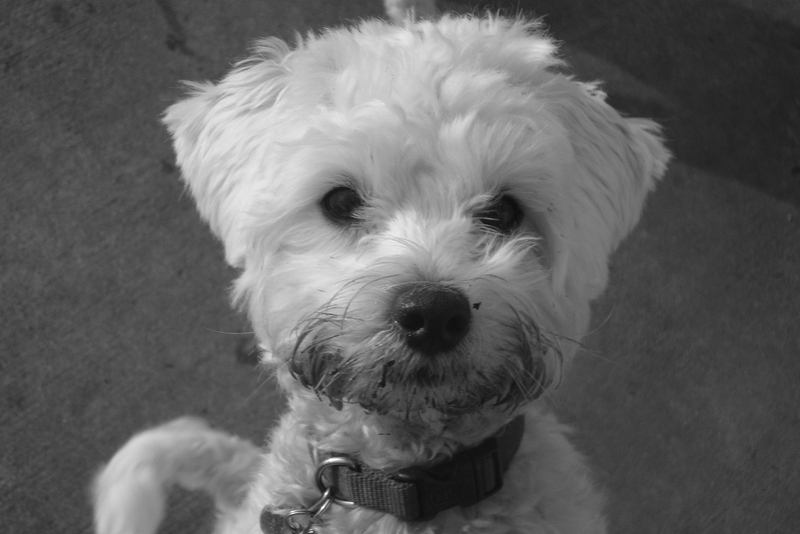 This week I thought I would do something a little different and share a picture of one of my former clients, Marley. She is the most adorable little dog. As you can see, she had gotten into some mud this day. 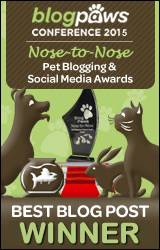 My thanks to our hosts for this blog hop You Did What With Your Weiner, My Life in Blog Years and Dachshund Nola. Unfortunately, WordPress.com doesn’t allow Java script so I can’t provide a direct link to the linky, but you can join here. Last weekend, we were walloped by another snowstorm. This one broke all the old records for amount of snowfall received in February. Go figure. But, it got me to thinking… maybe we shouldn’t be so unhappy about the extra snow. After all, spring is just around the corner and then we have THIS (see below) to look forward to. More snow? It could be worse. We’re starting a new year here at No Dog About It Blog and I figured it was high time that we learn to appreciate the finer things in life, like humor, fun, wild abandon, and yes…. mud.